their fortune on a gamble might be better off trying Georgia: Three people have won the lottery in Georgia multiple times in the past year alone. "Georgia is a very lucky state," Georgia Lottery spokeswoman Tandi Reddick tells Yahoo News. "There have been quite a few repeat Georgia Lottery winners who have Lady Luck on their side. It's fantastic for our players and very exciting for us." Even more amazing, Reddick provided Yahoo News with no less than 15 examples of repeat Georgia lottery winners. The most recent two-time winner is CNN producer Jennifer Hauser, 29, of Atlanta. Playing the instant scratch off game 50X The Money, Hauser took home a check for $1 million. 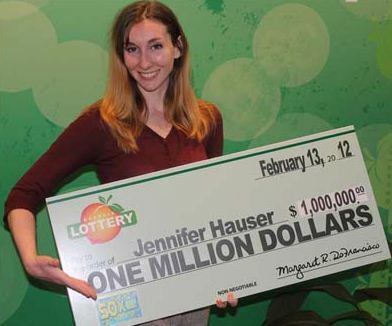 Incredibly, Hauser's win came less than three months after she took home a $100,000 prize on another state lotto game, Georgia Lottery Black. "I was a little numb," Hauser told the Atlanta Journal Constitution. "I didn't know what to think." Hauser says she used the first prize to buy a new car and pay off some bills and is thinking of buying her Mom a car with the second, larger payoff. The odds of winning any lottery are already incredibly slim, but the odds of winning a second time are astronomical. So it's especially astonishing that Hauser is actually the third person in less than a year to win multiple lotteries in the state of Georgia. Earlier this month, Erik Holmes, 44, won $500,000 in the scratch-off game $7 Million Jackpot less than a year after winning $104,000. And like Hauser, Holmes has been generous with his winnings, using his first jackpot to help out friends and family. And last November, I wrote about Delma Kinney, 50, who also is now a two-time Georgia lottery winner. Kinney won $1 million playing the Super Millions game. But that was only after another $3 million instant lotto prize back in 2008. Kinney's story may be the most touching of all: He used his original lotto winnings to set up a college tuition fund for the children he is raising on his own. And now, Kinney plans to donate part of his second prize fund to charity.